Continuing our review of the year, architecture editor Jessica Mairs looks at the themes that dominated construction in 2017, from outlandish shipping container designs and fantasy skyscraper concepts, to the demise of brutalist housing stock. We published more proposals for plant-covered buildings this year than ever before. Among the 15 plans – some under construction and others simply concepts – is Thomas Heatherwick's 1000 Trees development in Shanghai. As the name suggests, the building will eventually be covered in foliage dispersed across 1,000 columnar planters. 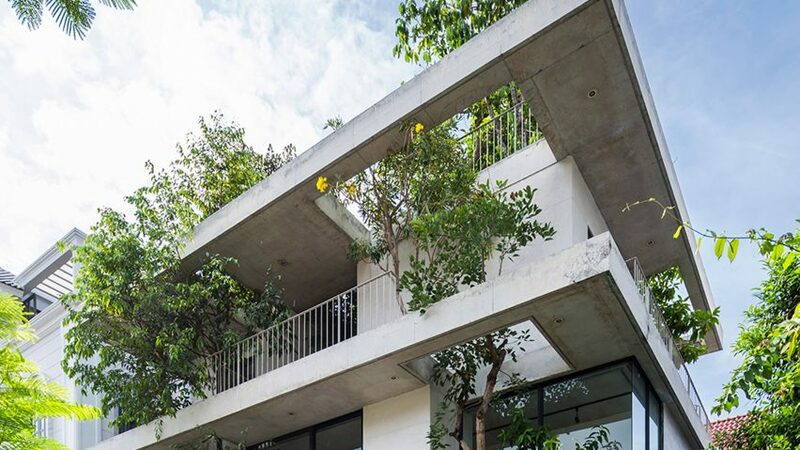 Vo Trong Nghia Architects carried on the trend by completing a pair of bamboo-covered homes in Ho Chi Minh City, one of which won a category award at this year's World Architecture Festival, while Stefano Boeri unveiled plans to build smog-eating "vertical forests" from Nanjing to Mars. While repurposing shipping containers isn't entirely a new idea, proposals have been ramping up in ambition this year, from hot tubs and swimming pools to back-yard offices and football stadiums. This year's most-read story was for a particularly striking proposal for a home made from a splayed arrangement of bright white cargo containers in the Californian desert. Also hugely popular with readers was a Brooklyn house made from stacked containers, angled as if capsizing into the pavement. The year began on a hopeful note for gender equity with Denise Scott Brown – famously denied her share of the Pritzker Prize – being awarded the Jane Drew Prize for women in architecture. But progress seems to have taken multiple backward steps, as a raft of poor industry decisions ensued. Along the way, UK Construction Week employed actors in "Vegas show girl" outfits to lure in customers, Dezeen's former editor Anna Winston wrote about the industry's culture of quietly condoning sexist behavior, and Bjarke Ingels was forced to defend accusations of sexism in the upper rungs of his firm. We rounded off the year by revealing the depressing findings of a Dezeen survey, which found that just three of the world's biggest architecture firms have a female leader. One of the world's tallest cross-laminated timber buildings completed last month in London, after years of anticipation about what heights solely engineered wood and glue might take construction. British furniture brand Vitsœ also used the material for its new "intentionally unfinished" headquarters and workshop in Royal Leamington Spa, and OFIS Arhitekti used cross-laminated timber to create a robust mountain cabin in Slovenia. The first hybrid timber tower was also given the go ahead in the US, where Skidmore, Owings & Merrill are tipped to be advising on new guidelines for timber construction. A fatal fire at Grenfell Tower brought the state of social housing – especially post-war stock – very much into the spotlight in the UK, with architects condemning the system as "dangerous, ugly, cruel and uncaring". The discussion continued in Australia with the private sell off of the Sirius building, and in the UK with the demolition of Robin Good Gardens, and the redevelopment of Park Hill and Thamesmead estates. But while a large portion of 2017 was spent bemoaning the present condition of social housing, the Royal Institute of British Architects awarded its highest accolade, the Royal Gold Medal, to "pioneer of quality public housing" Neave Brown. This year welcomed a bumper crop of avante-garde skyscraper concepts with varying levels of viability. Clouds Architecture Office proposed suspending the world's tallest skyscraper from an asteroid and having residents parachute to the ground, while Haseef Rafiei anticipated a 3D printing skyscraper that could dispense modular homes like a vending machine. Oiio bucked the trend and billed its proposal for a huge bending tower in New York as the world's longest building. As 2017 draws to a close, the bulldozers have also closed in on Robin Hood Gardens. After years of failed petitioning to have Alison and Peter Smithson's east London estate saved, it is now being razed – save a single apartment being preserved by the V&A museum. The final weeks of the year also spelled out an ominous future for the Sirius apartment block in Sydney, which has been put on sale for private development by the New South Wales government. The hottest colour trend of 2017 was millennial pink, despite what Pantone would have you believe. The craze that began its life in interior and accessories firmly crossed over into architecture, with Duggan Morris choosing the hue for the facade of a major Kings Cross development. Numerous other pink-tinged projects also emerged: Simon Astridge added a dusty pink extension to a London home, Productora painted a Californian bungalow in the hue and Extrastudio used pigmented mortar to give a former winery in southern Portugal a new lease of life. A London house extension with a sunken, Japanese-style bath kicked off the trend for Japanese-inspired interiors at the beginning of the year, by being crowned the winner of the Don't Move Improve! 2017 home improvement award. Another overhaul of a Victorian house in London continued the theme, pairing tatami matting and smoked-oak panelling with raw plasterwork to reference the Japanese heritage of the clients. Further afield, Japanese restaurant chain Nobu converted a 1950s beachfront hotel into a high-end, Japanese-inspired retreat in California. Pulleys, motors and cranks continued to mesmerize in 2017, from the bronze tubes drifting across the facade of Thomas Heatherwick's Fosun Foundation events space in Shanghai to the pivoting "solar wings" of Foster + Parters' Dubai Apple Store. At the low-tech end of the spectrum, Fernando Abellanas suspended a minuscule sliding artist's studio on tracks below a bridge in Valencia and Olson Kundig designed a house in the American West with a tilting 7-metre glass wall – both operated by hand cranks.